Exercise can have many physical benefits, including better energy, fitness, cardiovascular health and muscular strength and endurance. It can also help with side effects of cancer treatment such as fatigue, pain, depression, anxiety and stress. But living with metastatic breast cancer can affect the types of exercise you can do and the frequency in which you should be doing it. Bone metastases, for example, can lead to weaker bones and a higher risk for fractures or breaks. You may be advised to do strength exercises to help reduce these risks and at the same time, be instructed to avoid high-impact sports, like running. While the Public Health Agency of Canada recommends 2.5 hours of moderate exercise a week for adults aged 18-64 years your doctor may recommend a lower level of physical activity depending on your treatment and your side effects. It is important to report to your healthcare team when any new symptoms appear, such as shortness of breath or dizziness, for example. Whether you exercised regularly before your breast cancer diagnosis or not at all, physical activity may be beneficial for your health and wellbeing. Since everyone is different, it is important that you talk with your doctor first to determine how and when you can start exercising. 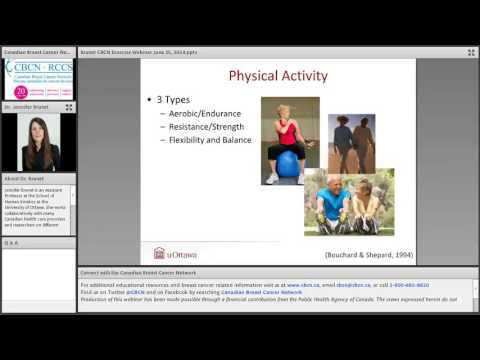 Watch our webinar on Getting and Staying Active after a Breast Cancer Diagnosis with Dr. Jennifer Brunet for a better understanding of how living an active lifestyle can positively affect your quality of life. Or you can read her tips on getting active on page 14 of Network News Fall 2014.